This pretty bulbous plant can be found growing in the wild in South America. Surprisingly, its winter hardiness is good. 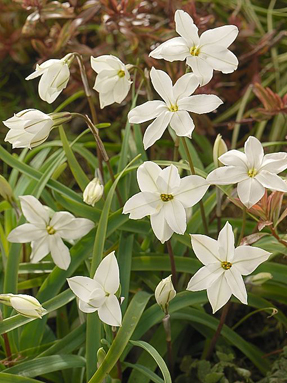 Ipheion is not widely cultivated and thus not commonly used. Like so many other bulbous plants, Ipheion cannot tolerate wet soil. Naturalisation is possible, but one drawback is that the plant's grassy leaves emerge before the winter season and then freeze. This has no negative effect on flowering. The shape of the flowers is unique: two wreaths of three petals join to create a star shape. 'Wisley Blue' has deep-violet flowers.